During a career in the major appliance industry I've witnessed the introduction and growth of many great new products such as microwave ovens, convection ovens, induction cooktops, steam washers and dryers, french door refrigerators, and professional ranges for the home. There have been a number of product flops, too. Here are three notable failures over the last two decades. Whirlpool's Polara represents an idea whose time never came. The idea was that you could take a roast from the fridge in the morning, pop it in the Polara where the roast would be kept cold by the Polara's refrigerator coils. At the appropriate time the refrigeration unit would shut off and the heating unit would kick in to cook your roast so that it would be ready just in time for dinner. Alas, consumers were underwhelmed by this product. The operation of the Polara was far from intuitive. Over the years, consumers have shown that they have no patience for products with a steep learning curve. In addition, the Polara was fraught with service problems. Perhaps, the coupe de gråce was Whirlpool's decision to give the product a somewhat futuristic design, ignoring the fact that kitchen appliances need to fit in the kitchen, not in a spaceship. Even though focus groups loved this idea (one particpant actually got out her checkbook), sales never met expectations on this traditional tumble dryer with an innovative, drying cabinet attached on top. Damp clothing hung on the drying rack inside the cabinet would be gently shaken as warm air circulated through the cabinet. Blouses, shirts, and sweaters dryed without tumbling and without wrinkling. In addition, the drying rack could be used to refresh sports coats and slacks, extending the time between dry cleanings. Unfortunately. the drying cabinet did not fit in all laundry rooms. It was a few inches wider than standard dryers, and the extra height of the drying cabinet could not be accomodated where there were shelves or cabinets above the dryer space. Since we tend to view the dryer as a companion piece to the washer, sales and marketing resources never seem to be devoted to dryers as a separate item. Throughout the 80's and 90's, the microwave oven was the hottest (no pun intended) appliance in the country, but microwave ovens have two major flaws. Foods cooked in microwave ovens don't brown, and they tend to dry out food, especially breads or baked products. One solution to this is to use “air-impingement” technology as a substitute and a supplement to microwave power. Pre-heated air is forced through small holes at a high speed. 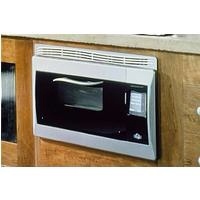 Along with microwave power, this system heats food quickly, allows browning, and keeps food moist. The Jenn-Air Accellis 5XP was an early example of this technology. The Accellis 5XP had a space age, Jetson-like look. It was extraordinarily noisy, and unreliable. In addition, Jenn-Air did not size the Accellis 5XP to fit in standard cabinet dimensions. Developed as a joint-venture with TurboChef, Jenn-Air soon decided to beat a hasty retreat, buying back the few Accellis 5XPs that had been sold. TurboChef went on to successfully market their version of air-impingement speed cooking to the commercial market where it can be seen today in Subway restaurants and Starbucks throughout the country. TurboChef has also introduced a double oven for the home. Each of these three products had fatal flaws. None of them received the marketing investment and attention that would make them a game changer, even if they weren't flawed. In future blogs, we'll cover appliance technologies and innovations that have merit, but need either more development or better marketing to succeed. We'll also discuss some old products that are no longer available, and we feel should be re-introduced. Can you think of any innovative appliances waiting to be discovered, or older products that you'd welcome back? Your comments are welcome. This entry was posted in Appliances and tagged appliance industry, appliances, Jenn-Air, marketing, Maytag, sales, Turbo Chef, Whirlpool. Bookmark the permalink. Art, you missed the Maytag Wide-by-Side. Prior to the resurgence of French Door refrigerators, the (briefly) innovative people at Maytag came up with this design – on the heels of Neptune washers and Gemini ranges. They figured consumers long frustrated by the narrowness of SxS refrigerators would rush to buy a solution that provided additional width in both the freezer and refrigeration sections. Deli platters and pizza boxes now had a home. Unfortunately price and a goofy asymmetrical look gave customers pause. The death knell was development of an improved closing mechanism for French Door. Its more balanced look and rising acceptance of bottom mount units made this the fastest growth segment in the refrigeration category over the past decade. Wide-by-Side became symbolic of Maytag’s frantic efforts to avoid bankruptcy, the “Edsel” of refrigerators. Yes, I sure did Warren. That was part of that stream of innovation started by the Neptune. 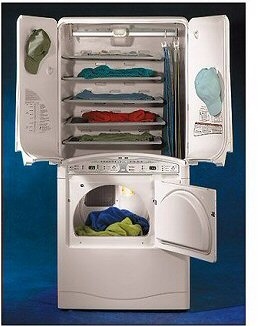 I have a future blog that will include the Gemini range as an idea that stuck, as well as the French Door refrigerator. Clearly my list of 3 was not inclusive. Just a few examples that came to mind. Somebody else pointed out that I also missed the Dacor 30″ dishwasher. What a turkey that was. Took 2 people to open the door. Thanks for your comment. Good point Karla. I’ll be posting a future blog about some appliance successes. Good ideas need good marketing. A part of Maytag’s failure with the drying center was the lack of good marketing and promotion. I want a brand-new Tappan 500 range with the slide-out burners and cutting board that folds down and dual ovens at eye level, especially with a smooth top, maybe induction, and the chrome interior ovens. Even a freestanding one with the lazy-susan storage beneath, but updated to full extension cushion close rollouts. I agree that the drying center was a great idea, however the marketing vision failed to align with the product innovation. It met a real customer need, but not without taking extra space. The target market should have been new construction and big builder spec homes. The extra cost of the product would have been more than offset by the fact that no cabinet is needed above it and the product would help sell the home. I own the polara range and have loved it for 9 years with no prob. Until 2013 when the main control board under the display panel went out , holy Moley ! Finding a tech that could diagnose it was a challenge , even Whirlpool Tech Line was no help, just an FYI if your polara starts to throw the code E-4 F-3 it is one of two problems the oven Sensors are bad or the board is bad …IF its the board , prepare to cry.. It’s a discontinued part and has no interchangeable sub part , hopefully I can save you a lot of agony and money : here are 2 companies that have them in stock Sears Warehouse 1-800-252-1698 or Angles Obsolete Parts 1-877-835-6030 be aware this board is not cheap ,but if you love this range as I do I decided to fix it . I hope this info. Will be helpfull to direct your tech in the right direction . Just found this article, and happy to comment on the Polara. The product was a great idea – in concept. The engineering of this product leaves much to be desired. With the primary controls sitting right above the oven opening, they are subject to heat from the oven. 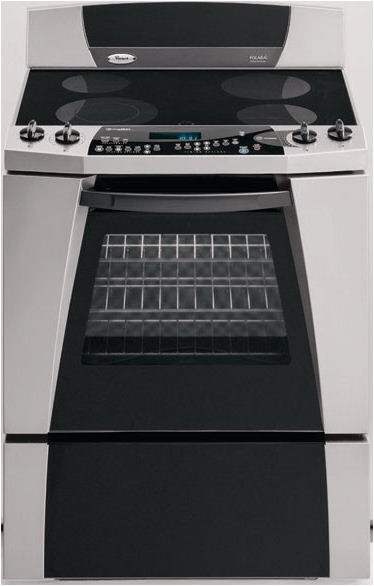 To make matters worse, the control panel actually sits up above the cooktop level by an inch, making it impossible to put a 12″ skillet centered on the largest burner on the cooktop front. There is also no seal between the control panel and the cooktop, and liquids that spill on the cooktop have an easy path to the electronics. The oven door hinges are weak. We replaced ours three times. As Roslyn mentioned, the mother board is not cheap, but there is a company whose name escapes me who can rebuild them or replace them. Had Whirlpool placed this product (with some engineering improvements) in their Kitchenaid line, it would have been more accepted. The price tag was high enough to disuade normal Whirlpool level buyers from buying it, and Kitchenaid level purchasers aren’t going to get a Whirlpool because of the quality difference. Ironically, everyone who hears about or sees our range in action thinks it’s the greatest thing since sliced bread… which leads me to believe that the company did a poor job from Engineering right through Marketing with this product. If I had the money, I would reinvent this thing without all the issues, probably as a wall oven, and put it on the market. Done right, this could have been a great product. The best refrigerator ever made was a refrigerator that hung on a wall made by General Electric in the late 50s it was not very deep and it hung on the wall at eye level ( food never got lost in there ) it had 2 doors for the fridge area & 1 for the Freezer area. this thing was so cool even Frank Sinatra had one the only problem with it was kitchen designers did not like having to re- arrange the Kitchen Cabinets . We had one when I was growing up, when the motor went in 1997 our whole family was upset. Till this day i still miss our Fridge! Thanks for your insights, Al. Although, I started in the appliance in 1975 and I’m still associated with it, this is the first time I’ve heard of this. Do you by any chance have a photo of it? Was there a name associated with it? Not doubting you at all, I’d just like to find out more. Very interesting. THANKS again! Hi, I just came across your article as I was doing a search on how to change the oven light on a Polara stove. I purchased one back in 2003 for gasp $ 1,500! It was a huge amount back then but was sold on being able to make meals in advance, refrigerate and then set to cook at a later time. It worked great (and still is so far 15 years later). Once your food is done cooking, then it goes to a warmer mode for an hour. If you do not get home, it goes automatically to refrigeration mode to ensure that the food doesn’t go bad. I was surprised to read that people felt there was a steep learning curve as the instruction manual couldn’t have been easier to understand. In addition, I have used it as just an extra refrigerator after large get togethers when I need extra storage space and have none. I have loved the look of it from the get go and now with all of the other stainless appliances it fits right in. I will miss the range tremendously when it does eventually stop working but until then, I still love it!